(Nanowerk Spotlight) Researchers often use living systems as inspiration for the design and engineering of micro- and nanoscale propulsion systems, actuators, sensors, and robots. With regard to propulsion, a lot of attention has been devoted to self-propelled chemically-powered micro/nanoscale motors, such as catalytic nanowires (read more: "Another nanotechnology step towards 'Fantastic Voyage'"), microtube engines (read more: "Microbots transport, assemble and deliver micro- and nanoscale objects") or spherical Janus microparticles (read more: "Novel motor system powered by polymerization"). One application area for micromotors is water decontamination, for instance the active degradation of organic pollutants in solution (see for instance: "Microscale garbage truck cleans polluted water"). "Although microrobots have recently proved successful for remediating decontaminated water at the laboratory scale, the major challenge in the field is to scale up these applications to actual environmental settings," Professor Joseph Wang, Chair of Nanoengineering and Director, Center of Wearable Sensors at the University California San Diego, tells Nanowerk. "In order to do this, we need to overcome the toxicity of their chemical fuels, the short time span of biocompatible magnesium-based micromotors and the small domain operation of externally actuated microrobots." In their recent work on self-propelled biohybrid microrobots, Wang and his team were inspired by recent developments of biohybrid cyborgs that integrate self-propelling bacteria with functionalized synthetic nanostructures to transport materials. "These tiny cyborgs are incredibly efficient for transport materials, but the limitation that we observed is that they do not provide large-scale fluid mixing," notes Wang. " We wanted to combine the best properties of both worlds. So, we searched for the best candidate to create a more robust biohybrid for mixing and we decided on using rotifers (Brachionus) as the engine of the cyborg." These marine microorganisms, which measure between 100 and 300 micrometers, are amazing creatures as they already possess sensing ability, energetic autonomy, and provide large-scale fluid mixing capability. They are also are very resilient and can survive in very harsh environments and even are one of the few organisms that have survived via asexual reproduction. "Taking inspiration from the science fiction concept of a cybernetic organism, or cyborg – where an organism has enhanced abilities due to the integration of some artificial component – we developed a self-propelled biohybrid microrobot, that we named rotibot, employing rotifers as their engine," says Fernando Soto, first author of a paper on this work (Advanced Functional Materials, "Rotibot: Use of Rotifers as Self-Propelling Biohybrid Microcleaners"). This is the first demonstration of a biohybrid cyborg used for the removal and degradation of pollutants from solution. The technical breakthrough that allowed the team to achieve this task is based on a novel fabrication mechanism based on the selective accumulation of functionalized microbeads in the microorganism's mouth: The rotifer serves not only as a transport vessel for active material or cargo but also acting as a powerful biological pump, as it creates fluid flows directed towards its mouth to feed. 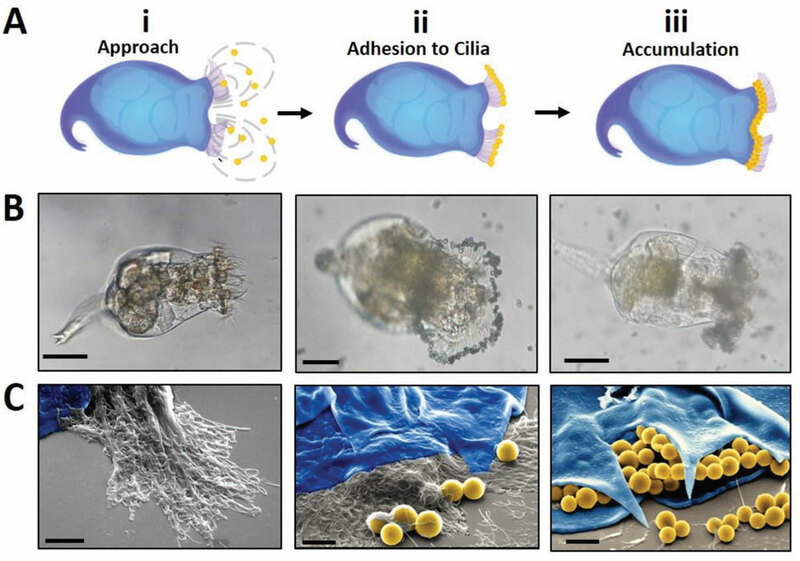 The specific active sites of the functionalized microbeads on the rotifer's mouth are subjected to high flow rate, generated by the rotifers' coordinated strokes of cilia bands, which induce a flow field toward the mouth. The researchers use this flow, without an external force, to get the pollutants towards their 'cyborg microfilter'. The team exploited the negative charge on the rotifers' cilia surface for confining positively-charged functional particles – plastic microbeads with enzymes that are used to degrade or capture pollutants in water. 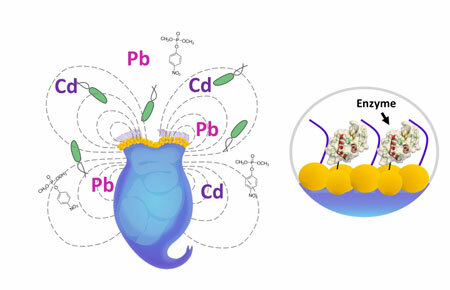 "For example, we demonstrated the accelerated decontamination of bacteria (E. coli), nerve agents (methyl paraoxon) and heavy metal ions (Cd and Pb) from aqueous solutions turning the cyborg into a kind of micro-Roomba," says Soto. Freely swimming rotibot illustrating the mixing of tracer particles in solution. Going forward, the team is looking to push the limits of what our new platform can do. Initially, they aim at making this platform fully degradable by replacing the plastic (latex and polystyrene) microbeads, utilized in this proof-of-concept study, with biodegradable functional microparticles. They also hope that this method can be expanded to other decontamination applications by changing the functionalization of the attached microbeads. Forming swarms of microcyborgs by inducing collective behavior, taking advantage of their group response to specific stimuli, is another item on their list. "A main challenge for us is the creation of a universal platform that can be translated into diverse applications," Wang concludes. "This will require the fine-tuning of the cyborg cleaners' operation and the synchronization between the microorganism engine and the desired task."